through my hands: Custom orders & "Can you pick that out?" Custom orders & "Can you pick that out?" I've been doing custom embroidery for over 10 years now and have been asked by customers to pick out nearly every type of embroidered logo on almost every type of garment. Many times it is because of the budget and a desire to reuse an item. I rarely ever accept a job like that because a) it's very labor intensive, b) it's difficult to not damage the material, and c) I don't want customers walking around wearing something that looks bad. If the item is a nice jacket, the best solution is to create a patch to cover an old logo, and then embroider the new logo on the patch. This process doesn't damage the jacket, and gives a nicer, more professional appearance. The downside is that the patch shape may not match the new logo because the patch is the shape of the unwanted logo beneath it. A customer recently requested that I add some embroidery to an item that had special meaning attached to it. It had extensive embroidery already on it and quiet a bit of the sides was unraveling. And, in an effort to help me, they picked out all of the embroidery that was in the center area where they wanted something else embroidered. The material is a very lightweight velvet-like fabric. The removal process left a shadow outline of what had been previously embroidered, and to make it more difficult the weave of the fabric now had open holes everywhere. I tried hard to keep my face from contorting into a grimace while I listened to the wants and needs of the customer. If it had not been for a 90th birthday for a dear friend of theirs and that the item meant so much to them, I would have turned the job down because there was no way I could make this look new and perfect. Now what to do to make it better..... I started by completely removing the damaged sides from the panel. Next, I trimmed the top of the panel to match the bottom. I used tracing paper to make a template of the center area and cut out a new piece of fabric from one of the side areas that I removed. 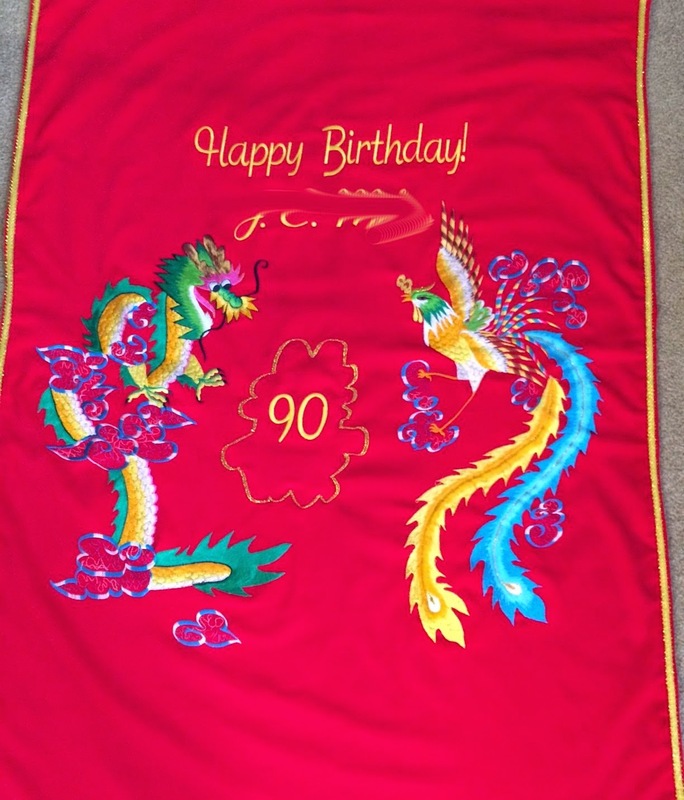 I embroidered the "90" on it, and then appliqued it to the damaged area using a small zigzag stitch and mono-filament thread. 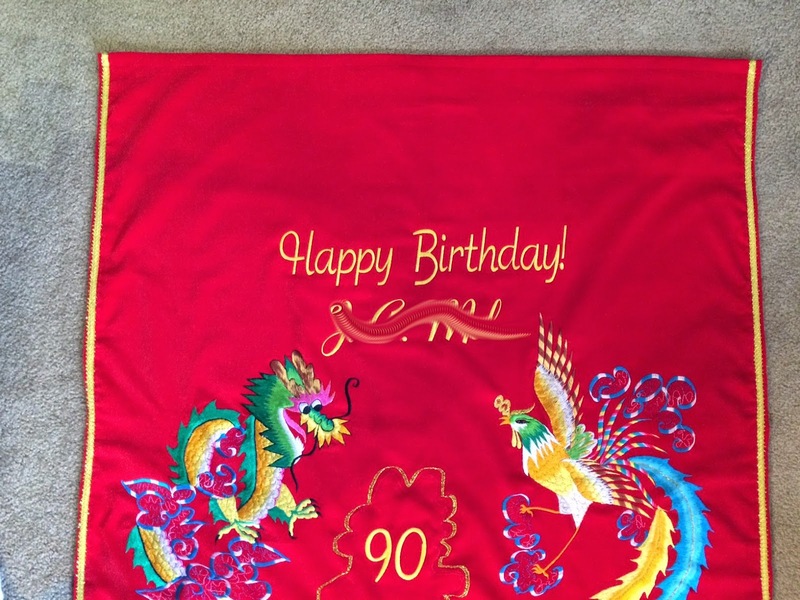 I then embroidered the Happy Birthday wishes on it and hemmed the top and sides. The customer was happy with how it came out, but I sure don't want to do another job like this one. Moral to the story is whether you do embroidery with a commercial machine like I do or you use a home embroidery machine, the process of embroidery is the same. Embroidery just like a tattoo that you get on your skin is not easy to remove, and the removal process may leave scars that are difficult if not impossible to fully hide. Nearly always, it will be worth it to just start from scratch on a new garment. View from the back shows how the weave of the fabric broke down. Click on pictures to enlarge. Customer panel. Both sides were damaged.